If you frequent natural or healthy food stores, you have most likely noticed the abundance of Coconut Oil being used in products these days. And the media has touted it as a natural wonder for a range of conditions, from weight loss to diabetes, and as a natural anti-aging cream. So to help you make sense of all the hype, we’ve pulled together the basics for you, and we are adding a recipe section dedicated to foods containing Coconut Oil to help you integrate this natural wonder/superfood into your daily life. So read on for our review of whether this trend is worth all the hype. Our vote is YES, and with all the internal health and outer beauty benefits, you’ll want to get in on this trend for the sake of your health today! Already know why Coconut Oil rocks and just want a smoking hot deal on it? Then click the image here for our fave brand – Tropical Traditions! Their all natural, Gold Label Virgin Coconut Oil has the most mild flavor of all Coconut Oils we’ve tested, and we absolutely love it. In addition to Coconut Oil you can also browse their other products, including lotions, grass fed meats, soaps and more. Be sure to click the image to the right to browse their products and start enjoying the best Coconut Oil on the market! Interested in Tropical Traditions’ Weekly Sales? Click below for a direct link to browse all top sales! 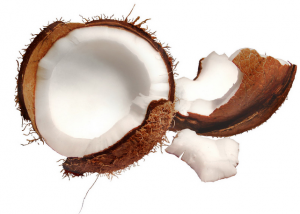 What we do know is that Coconut Oil is incredibly good for your heart. The truth is this: it is unsaturated fats that are primarily involved in heart disease and too much sugar and processed foods, not the naturally occurring saturated fats as you have been led to believe. Coconut oil has actually been shown to help optimize body weight, which can dramatically reduce your risk of developing Type 2 diabetes. Besides weight loss, boosting your metabolic rate will improve your energy, accelerate healing and improve your overall immune function – pretty amazing! But MCTs (7) , being smaller, are easily digested and burned by your liver for energy — like carbohydrates, but without the insulin spike. MCTs actually boost your metabolism and help your body use fat for energy, as opposed to storing it, so it can actually help you become leaner. 3) Vegetable oils contribute to the overabundance of damaged omega-6 fats in your diet, throwing off youromega-6 to omega-3 ratio. Nearly everyone in Western society consumes far too many omega-6 fats — about 100 times more than a century ago — and insufficient omega 3 fats, which contributes to many chronic degenerative diseases. The connection between coconut oil and weight loss is interesting. Farmers in America discovered this early last century when they tried to fatten their cattle by feeding them coconut oil. Instead of gaining weight, their cattle lost weight! So again, this is not news. Do a simple Internet search such as “benefits of coconut oil” and you will get plenty of details. You may ask, isn’t coconut oil a saturated fat? And aren’t saturated fats harmful? Yes, coconut oil consists of 90% saturated fats. But whether or not saturated fats are harmful depends on who you ask. Among mainstream nutritionists, the idea that saturated fats cause heart disease is an “absolute truth” that is never questioned. Those who question this belief, however, point out that mankind has been consuming mainly saturated fats – in the form of butter, lard, coconut oil, etc – for thousands of years, yet heart disease was rare before the 1920s. If anything, the rise of heart disease in recent decades may correspond to the increasing use of polyunsaturated vegetable oils like corn, safflower and canola, as well as margarine. Now that we’ve talked about the internal benefits, let’s focus a bit on the external “beauty” benefits! Coconut oil can act as an antioxidant for your skin as well and can be used in place of lotion or even lip balm. Women can use it to remove eye makeup and men can use it in place of shaving cream. Using coconut oil on your face may even help reduce fine lines and wrinkles. Since it is completely natural and chemical-free, it is ideal for people with sensitive skin. According to ORGANICFACTS.NET, there are some pretty great beauty regimen benefits from Coconut Oil. Read on for some natural home remedies! Coconut oil is one of the best natural nutrition for hair; it helps in healthy growth of hair providing a shiny complexion. Regular massage of the head with coconut oil ensures that your scalp is free of dandruff, lice, and lice eggs, even if your scalp is dry. Coconut oil is extensively used in the Indian sub-continent for hair care, where it’s common to apply coconut oil on their hair daily after a bath. It’s an excellent conditioner and helps in the re-growth of damaged hair, and provides the essential proteins required for nourishing damaged hair. It’s often used as a hair care oil and in manufacturing various conditioners and dandruff relief creams. Coconut oil is excellent massage oil for the skin as well. It acts as an effective moisturizer on all types of skins including dry skin. The benefit of coconut oil on the skin is comparable to that of mineral oil, however, unlike mineral oil there are little chances of adverse side effects on the skin with the application of coconut oil. Coconut oil is a safe solution for preventing dryness and flaking of skin, and also delays wrinkles and sagging of skin which normally become prominent with age. Coconut oil also helps in treating various skin problems including psoriasis, dermatitis, eczema and other skin infections. Coconut oil forms the basic ingredient of various body care products such as soaps, lotions, creams, etc., used for skin care and helps in preventing premature aging and degenerative diseases due to its antioxidant properties. So, now that you know why it’s so good for us, you can head on over to Tropical Traditions and pick up any one of their many Coconut Oil options! Our personal favorite is Tropical Traditions Gold Label Standard Coconut Oil, and if you click on the image here it will take you to their site where you can buy any of their other Coconut Oils.